The ketogenic diet is now one of the most popular dietary lifestyle approaches to support weight loss, address neurological disorders, and manage insulin resistance and prediabetes. The ultimate goal of this high-fat, moderate protein, very low-carb diet is reaching and maintaining the natural metabolic state of ketosis. While the body normally produces energy from glucose, when glucose stores are low, it will metabolize fat stores for energy. Ketone bodies are produced by the liver as a byproduct of gluconeogenesis, the production of glucose from non-carbohydrate sources. In healthy individuals, ketones are utilized to provide energy to cells when glucose is low or absent. Ketones are generated as a result of fasting, starvation, a carbohydrate restrictive diet, prolonged exercise, or inadequately treated diabetes. When glucose levels are high, the liver responds by absorbing excess glucose and storing it as glycogen until needed. Processing the body’s fat is a key function of the liver as well. Once the liver is full of glycogen, it will turn excess glucose into fatty acids for long-term storage as body fat. When glucose levels are low, the body releases glycogen as glucose, converts body fat back into fatty acids, and will break down amino acids, all to produce energy. As the body stores limited amounts of glycogen in the liver and muscles, glycogen is rapidly depleted. In order to feed the brain, the liver will convert amino acids and other compounds into glucose, which is released into the blood stream along with ketone bodies. Known as “glucose sparing,” the muscles and organs will switch to fatty acids for energy, conserving glucose for the brain. Diets that focus on low carbohydrate and higher fat and protein intake effectively remove glucose from the diet, requiring the body to break down fat stores. 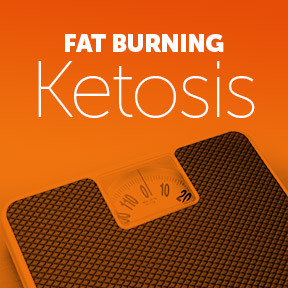 When the body is in the fat burning metabolic state of nutritional ketosis, fewer calories are required for satiety, which leads to decreased hunger and facilitates weight loss. The ketogenic diet focuses on the reduction of simple dietary carbohydrates, such as processed grains, sugary foods, and fruit juice. Limiting the amount of dietary carbohydrates encourages the brain to derive sufficient fuel from endogenous glucose produced from protein consumption, dietary fatty acids and the limited amount of complex carbohydrates the diet permits. The ultimate goal of this diet is to reach a metabolic state where ketones become the main fuel source for both body and brain. A ketogenic diet may benefit physical and cognitive performance in healthy individuals. Weight loss – Studies show that those on a low-carb, high-fat diet lose more weight in a shorter time period than those on a low-fat diet, even when the low-fat dieters are actively restricting calories. Studies consistently show that consumption of protein and healthy fats, along with a reduced carbohydrate intake, leads to a reduction in appetite, and consequently effortless caloric reduction. Neuroprotection – With neurological diseases, deficient energy production is a major concern. During metabolic stress, ketones serve as an alternative energy source to maintain normal brain cell metabolism and may be an even more efficient fuel than glucose. Studies have shown that a ketogenic diet increases the number of mitochondria, the energy factories in brain cells, and may enhance energy metabolism in the hippocampus, the part of the brain important for learning and memory. In age-related brain disease hippocampal cells often degenerate, leading to cognitive dysfunction and memory loss. With increased energy reserve, neurons may be able to fend off disease stressors that may normally exhaust the cell. Reduced inflammation – By increasing dietary fatty acid intake, the production of harmful oxidant molecules is reduced. This in turn curtails the progression of chronic inflammation and the downstream propensity toward chronic and painful conditions. Per the National Institutes of Health (NIH), a ketogenic diet could offer a non-pharmacological option for reducing both inflammation and pain. High-fat ketogenic diets have long been known to be effective against pharmaceutical-resistant seizures. Like seizures, chronic pain is believed to involve increased excitability of neurons. As compared to glucose metabolism, ketone metabolism produces fewer reactive oxygen species known to contribute inflammation. Reduction of visceral fat – It is known that low-carb, high-fat diets lead to successful weight management. Weight reduction when needed supports overall health and decreases disease risk. Even more significant, low-carb diets are very effective at reducing harmful and stubborn abdominal visceral fat that tends to lodge around internal organs. Visceral fat contributes to increased risk of metabolic syndrome, heart disease, and type 2 diabetes. Reduced blood sugar and insulin levels – Limiting carbohydrate consumption is a very effective way to lower blood sugar and insulin levels. While those with diabetes should carefully monitor their dietary carbohydrate intake with their healthcare providers, the ketogenic diet has been shown to effectively treat and possibly reverse type 2 or prediabetes. In some studies, individuals with type 2 diabetes were able to reduce or eliminate glucose-lowering medication after 6 months on a ketogenic diet. Reduced risk of developing metabolic syndrome – Metabolic syndrome is a condition highly associated with the risk of heart disease and diabetes. Symptoms include abdominal obesity, elevated blood pressure, elevated fasting blood sugar levels, high triglycerides and low HDL cholesterol levels. All five symptoms appear to dramatically improve on a low-carb, high-fat diet. This entry was posted in Home and tagged Ketogenic Diet, Neuroprotection, Reduced blood sugar and insulin levels, Reduced inflammation, Reduced risk of developing metabolic syndrome, Reduction of visceral fat, weight loss, What Is Ketosis. Bookmark the permalink.